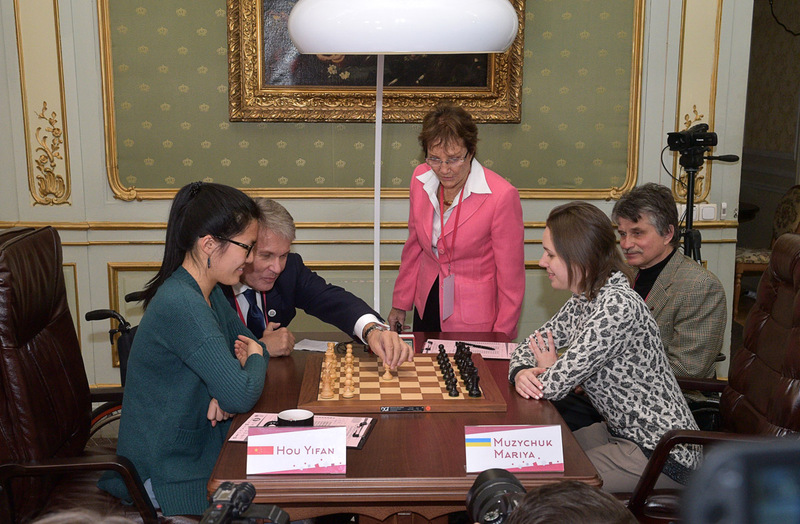 On March 3rd, the second game of Women’s World Chess Championship Match has begun in Potocki Palace between World Champion Mariya Muzychuk and a challenger Hou Yifan. 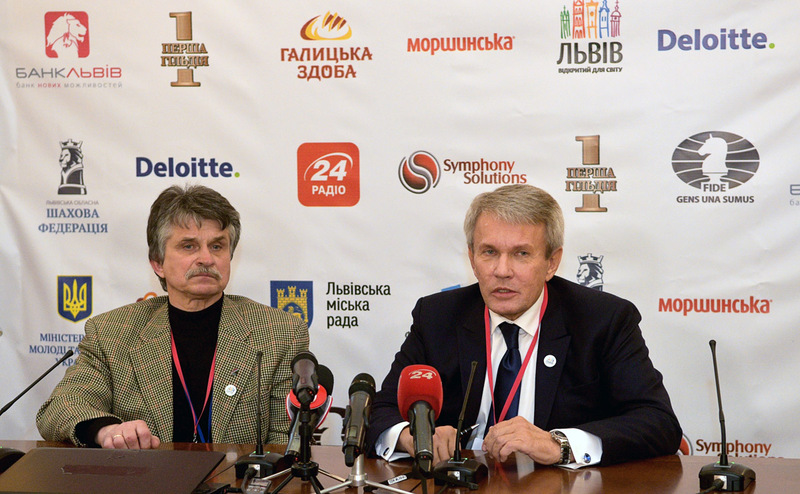 The first moves 1.e4 e5 were made by Valeriy Sushkevych, the President of the National Paralympic Committee, and Yaroslav Hrybalskyi, the Head of Lviv Regional Department of the Ukrainian Rehabilitation Fund for Disabled. 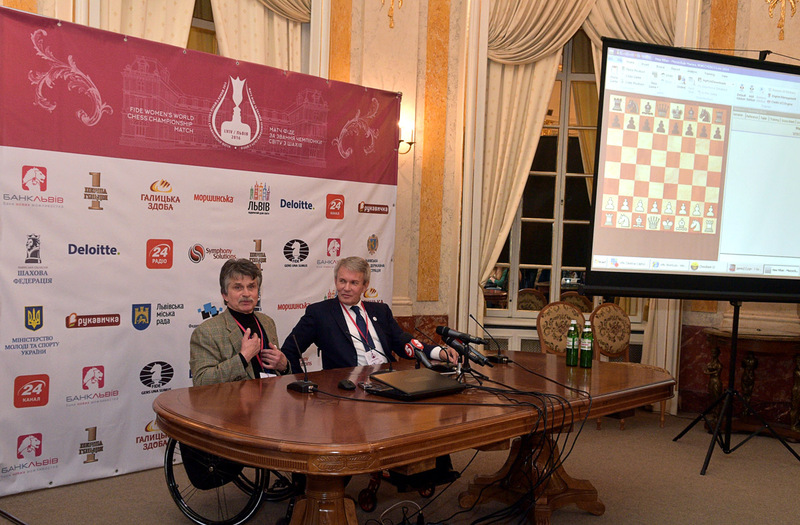 Mr. Hrybalskyi is convinced that chess is not only an interesting game, but also a great measure for rehabilitation of disabled. ‘Today I’ve remembered the times when I was in a critical condition in a recovery room of Neurosurgery. There were two boys with neck injury in the same room, and they played blindfold chess with each other! And today thanks to on-line broadcasting, thanks to media all people, who are now in rehabilitation, can see that the first moves in such remarkable event have been made by disabled people. This is really encouraging’, said Mr. Hrybalskyi. ‘It’s a great honour to be here today and start the second game. I think the invitation to make the first move in the Match identifies a great change in mindset of Ukrainians and Ukrainian society. I believe the participants of the Match will show us very beautiful games’, said Valeriy Sushkevych.